Outdoors Unlimited uses only silent non-motorized,self bailing rafts on our trips. You have the choice of either riding in a raft with an OU guide at the oars, or choosing the adventure of a paddle boat where you participate in powering the boat as your guide steers from the stern of the boat. Life on the river is elemental. You will find unique satisfaction in simple things; a cool drink of water, a soft beach to lay your bedroll on, a quiet conversation with friends. Each day is measured by where you are and what you have done, your city routines quickly succumbing to the pattern of Canyon living. 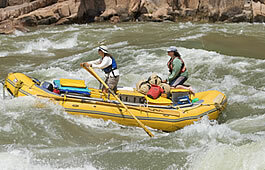 Traveling by oar powered craft is the classic method of rafting the Grand Canyon, dating back to the first explorations by John Wesley Powell in 1869. Our oar powered rafts carry up to five guests plus the guide, who maneuvers the raft with a set of oars mounted on the boat. Relaxation is the signature of the oar boat, allowing more time to socialize, look around and take photographs while still offering an exciting ride through the rapids. 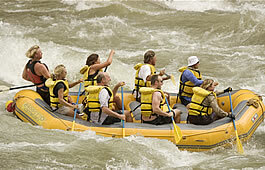 Oar boats are a comfortable way to enjoy the long quiet stretches as well as the famous rapids of the Colorado River. Paddle rafting is the ultimate way to participate in a Grand Canyon river trip. It is an exhilarating ride in one of the smallest boats to run the Colorado River. As a paddler you are an integral part of powering and maneuvering the raft down the river at the command of the "paddle captain". There are six paddlers for each raft with a guide in the stern. Our self-bailing paddle boats carry no gear, giving them a quick response and an unmatched ride. Available as an option at a small extra cost, paddling can be physically demanding and is not for everyone.